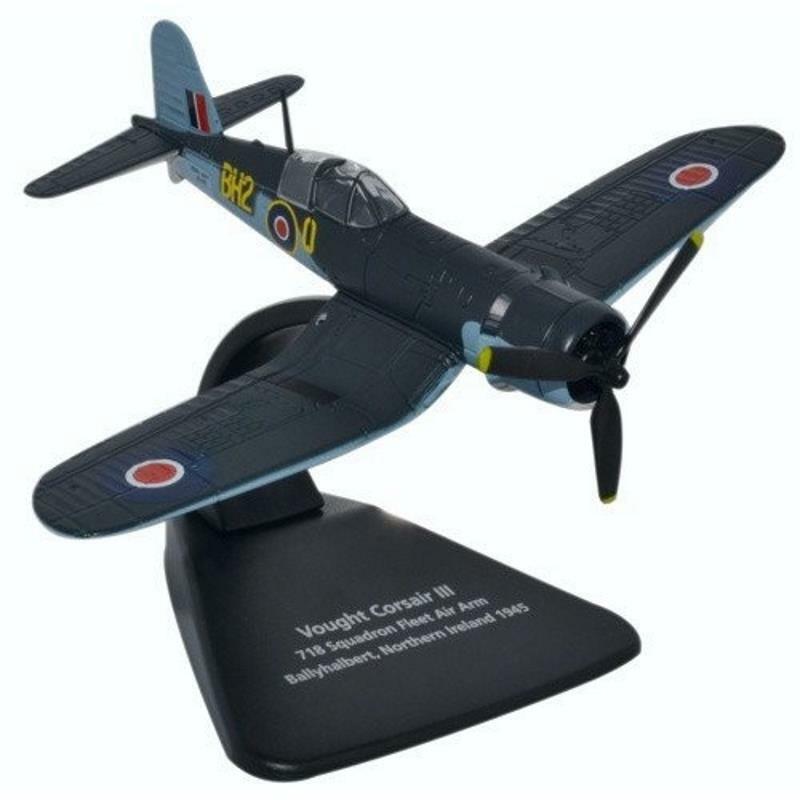 Oxford Diecast-Models:Oxford 25420 https://www.warplane.com/images/Products/25420.jpg The Vought Corsair III is as deployed to 718 Naval Air Squadron, a squadron of the Royal Navy Fleet Air Arm based at Ballyhalbert, Northern Ireland in 1945. Decorated in dark grey-blue/ mid grey-blue and off-white, the model also features the RAF roundels on both the upper and under wings. The aircraft numbering 0 - BH2 is painted yellow on both sides of the fuselage behind the cockpit. Description: The Vought Corsair III is as deployed to 718 Naval Air Squadron, a squadron of the Royal Navy Fleet Air Arm based at Ballyhalbert, Northern Ireland in 1945. Decorated in dark grey-blue/ mid grey-blue and off-white, the model also features the RAF roundels on both the upper and under wings. The aircraft numbering 0 - BH2 is painted yellow on both sides of the fuselage behind the cockpit. Additional Info: AC070 includes a display stand.